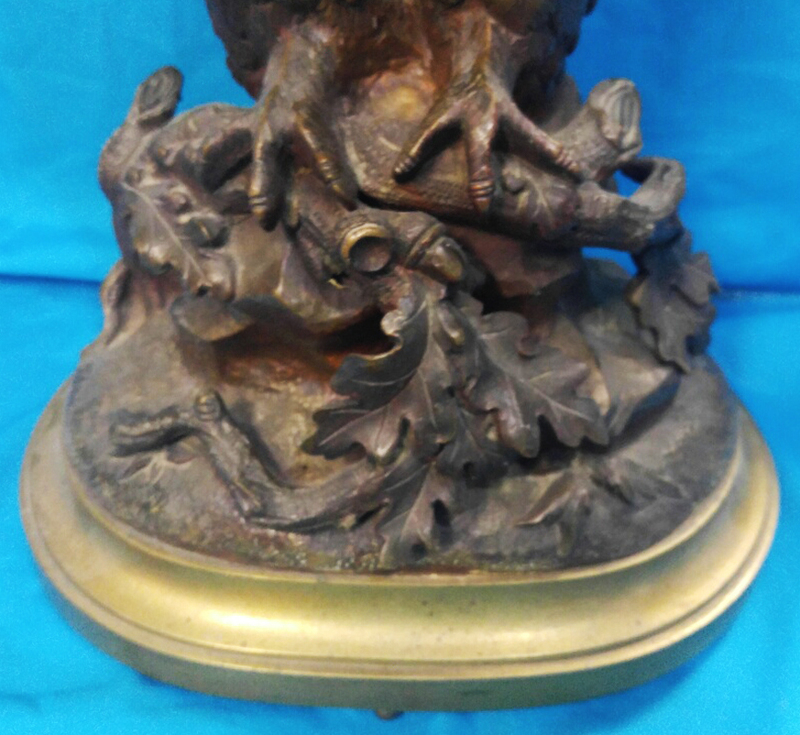 Estate, large superb bronze French signed Japy Freres & Cie with the Paris Exhibition Grande Medaille D'Honneur seal. 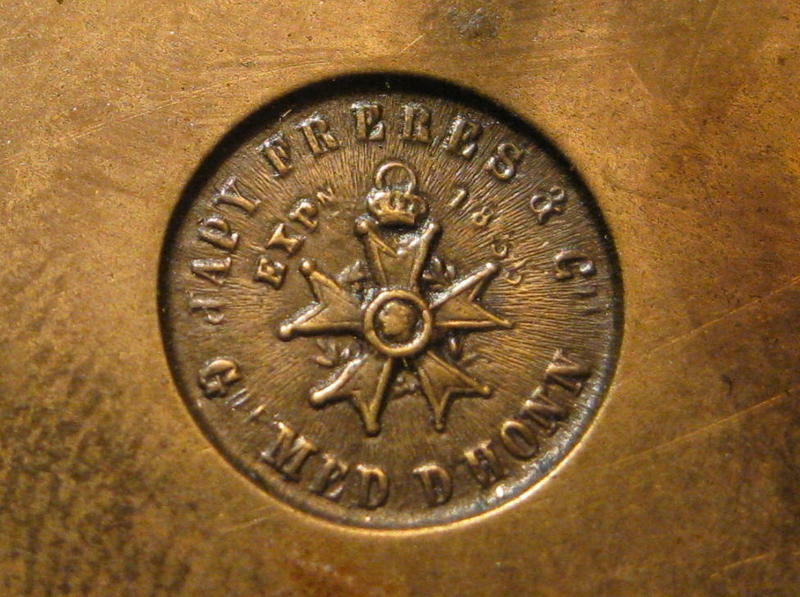 It is also stamped E. P. #7951. 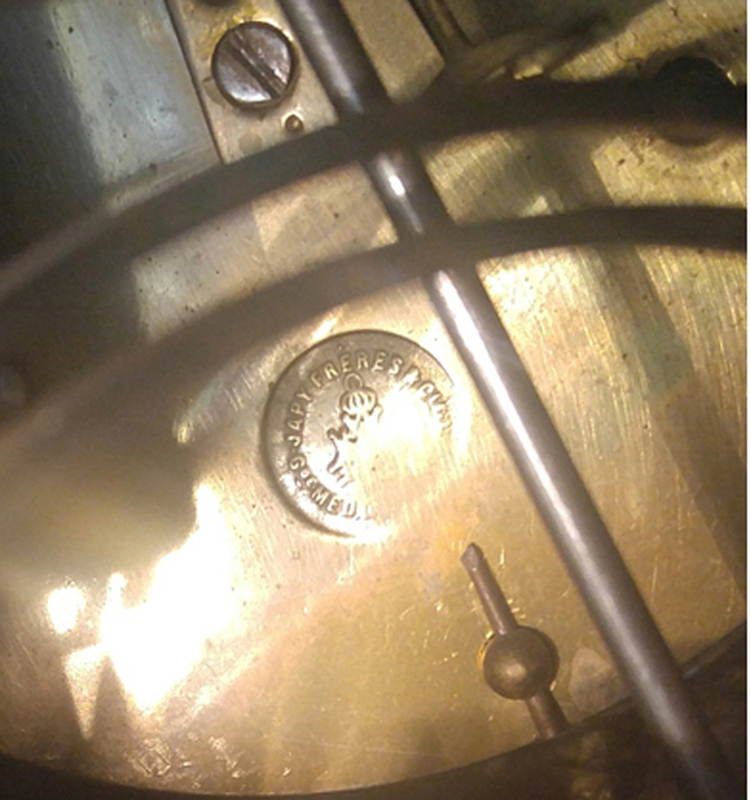 We believe it to be from the 1860 to 1870. 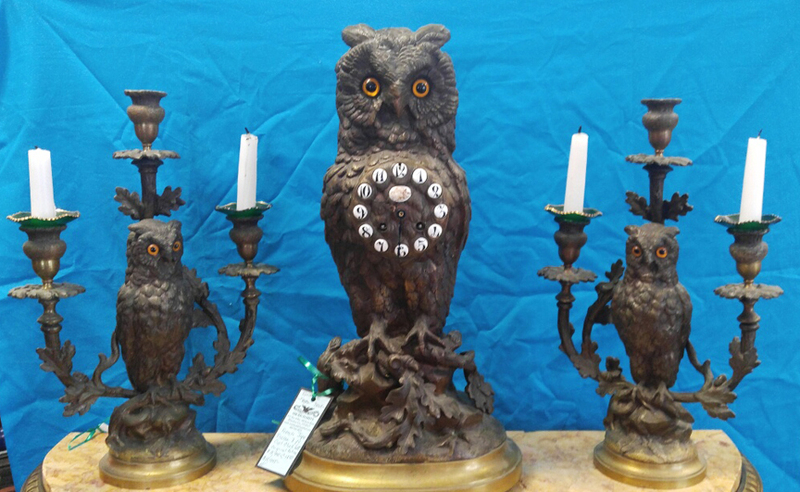 A handsome set with all the full bodied owls having gorgeous glass eyes, individual porcelain numbers, on bronze oak tree branches with acorns. 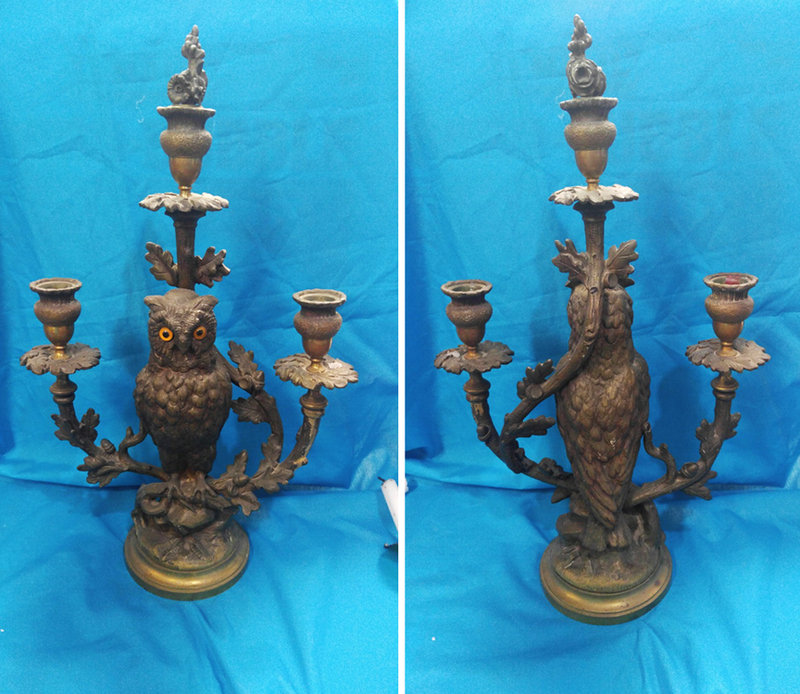 This is a very heavy set, with the side owl candelabras weighing about 12 pounds each. 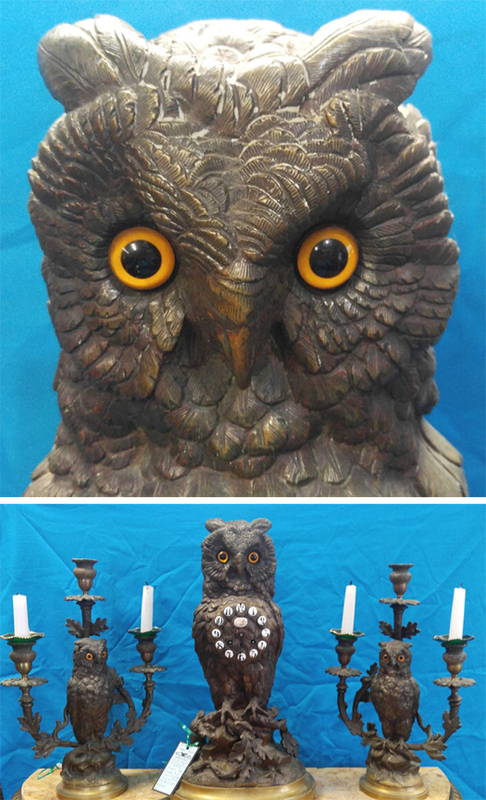 The handsome main owl clock measures 19 1/2" tall, 10 1/2" wide and 7 1/2" deep. 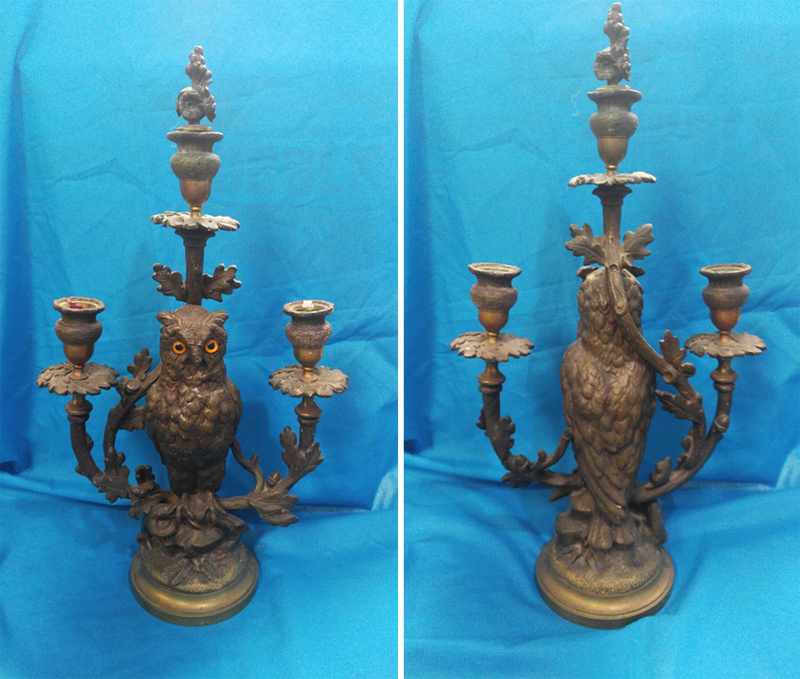 Each of the side owl candelabras are 19" tall with the center removable finials, 11 1/4" wide and 5" deep. 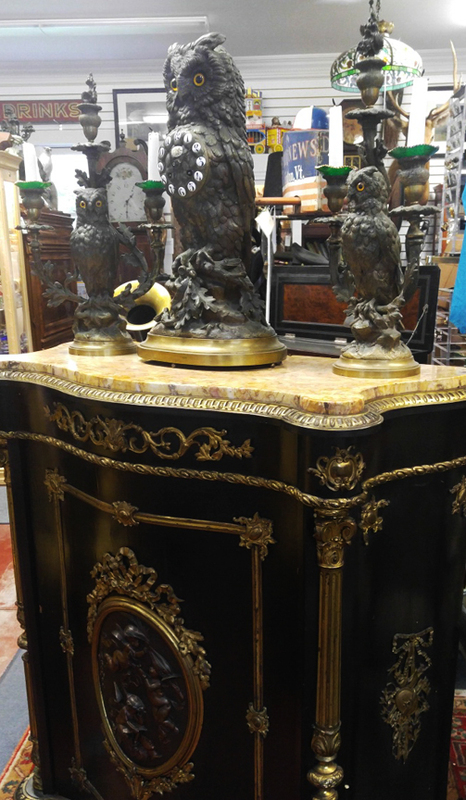 They are in great condition, having the original patina. 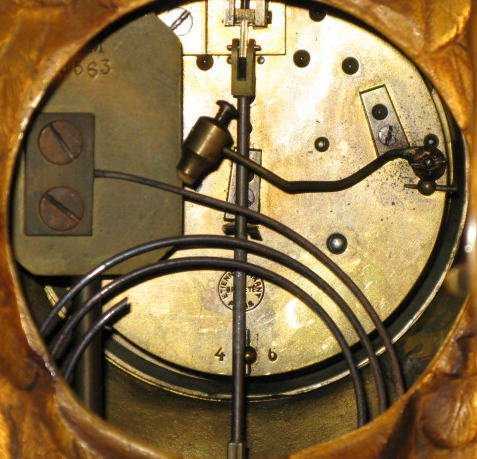 A very rare clock set. 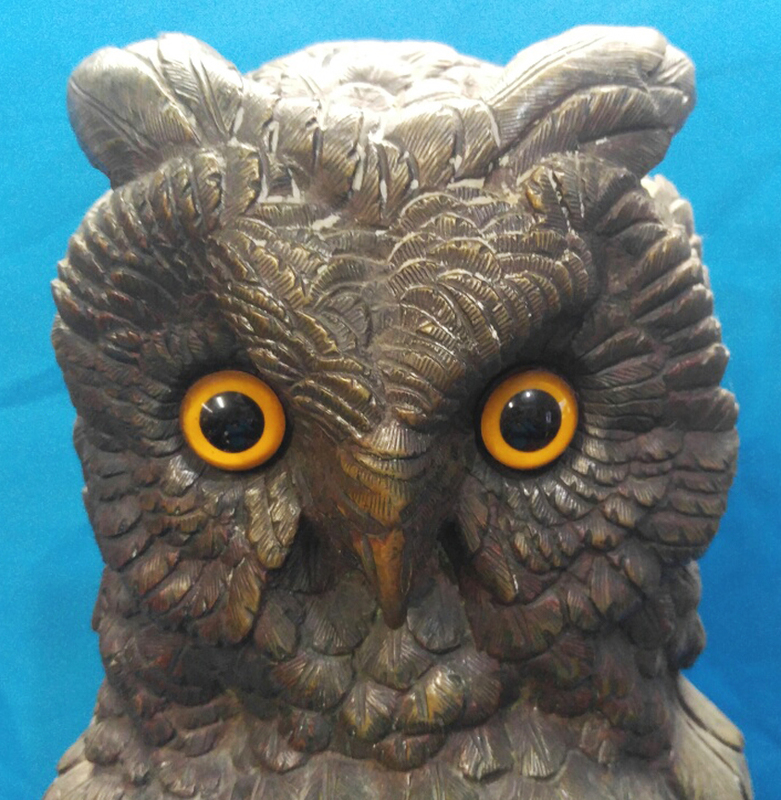 Probably the best investment clock set we have had in a long time. 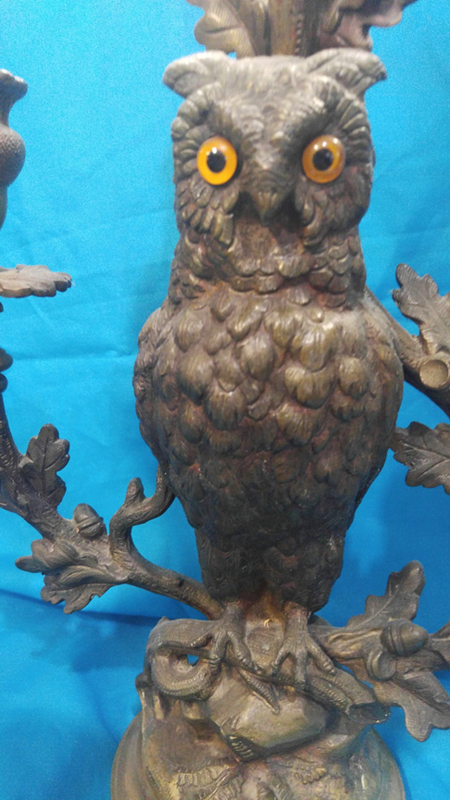 We have only seen a record of one other 3 piece owl clock set like this, selling in 2010 by Fontaine, and it was not bearing the Grande Medialle D'Honneur seal. 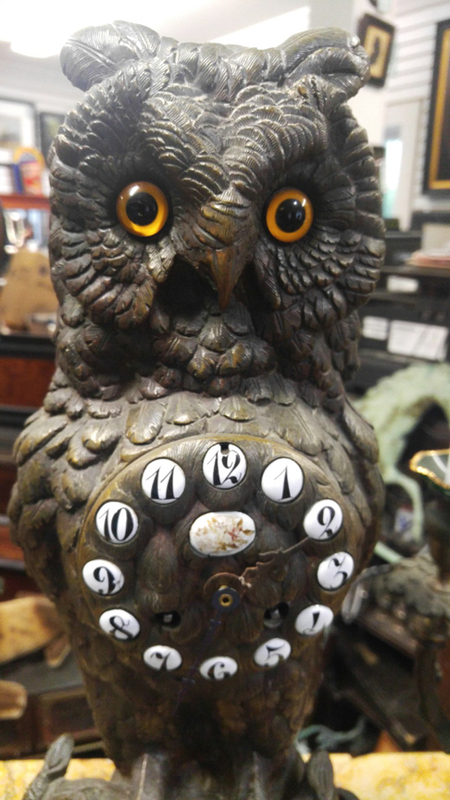 In 2009 we saw where just the owl clock sold by Harris Auctions. 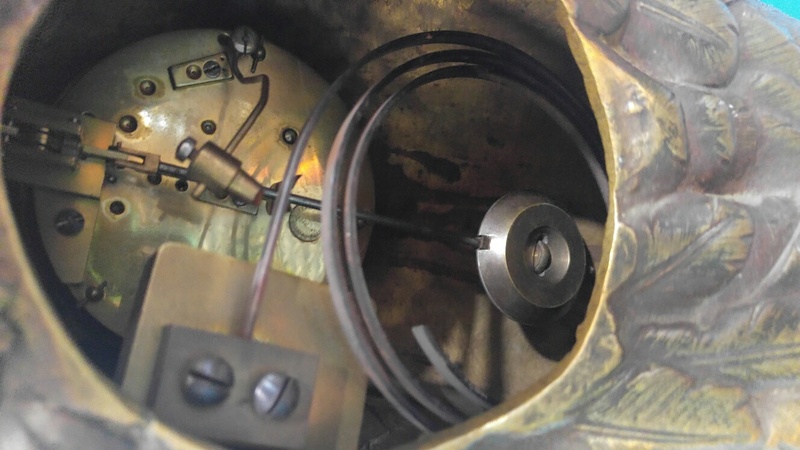 The clock works for awhile, then stops, move it, it works for awhile, then stops. May need cleaning. 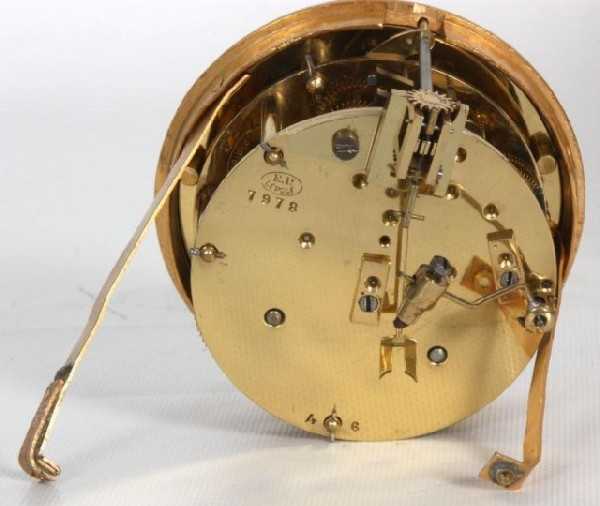 We sell all clocks as is, however we do guarantee that this clock set has its original works.